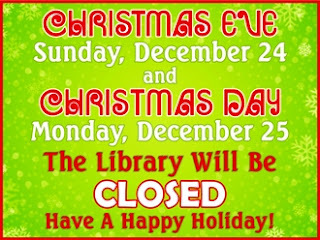 The Library will be closed Sunday and Monday, December 24th and 25th, for Christmas Eve and Christmas Day. Be sure to stock up on music and movies for your holiday festivities (and on books for the quiet times in between!). The Library will re-open on Tuesday, December 26th at 9:30 am. Don't forget, the Library is always open on the web at http://www.roselle.lib.il.us to download music, movies and books.